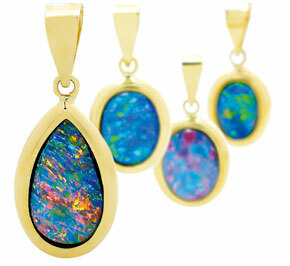 Opal is from the Greek "Opallos" meaning to "see a change of colour. Each Australian opal is unique and the different varieties offer a spectacular choice of colour, shape and size. When rotated, the opal displays a constantly changing interplay of fiery colours. The finest quality stones can command prices similar to the finest emeralds, rubies and diamonds. Opal is not only one of the world's most beautiful precious gemstones; it is also one of the worlds rarest. Opals rarity has made it a desirable and at times divisive part of many cultures over thousands of years. Technically, opal is non-crystalline silica (in a rigid gel form) containing approximately 5% to 9% water. Non-crystalline silica is similar to quartz and sand. On the Mohs Scale of Hardness, a scientific scale of the relative hardness of minerals, opal rates at around 5.5 to 6.5. As a comparison, diamonds rate at around 10, sapphires 9, quartz 7 and pearls 3 - 4. Opal - widely know as the Queen of Gems, it is a truly remarkable gemstone. In 1994, Opals was declared as the national gemstone of Australia; the birth place of over 96% of all opal production in the world. The comparison of the value of Opal to that of other more ìcommonî gemstones including diamonds, rubies and sapphires is often difficult and unfair, as the natural characteristics of opals are so diverse that many factors impacting on its value are not applicable for other gemstones. When valuing opals, one should look at the sharpness and brightness of the colours presented by the opal, the overall shape and form of the opal, the consistency of the colour across the entire face of the stone. Equally importantly, the amount of play of colour shown on the opal also affects the price of opals. It is the colour palette and the play of colour when turning the opal which makes it so unique, to the extent that no two pieces of opal will ever be the same. The colour of the opal is the result of lights being diffracted by the pattern of silica spheres, which is arranged differently in each and every opal. Play of colour in opal, on the other hand, refers to fact that when the angle of the light source changes, the light diffraction also differs, resulting in a change in colour and outward appearance of the opal.